: A certain amount of speculation has taken place regarding the origin of this breed, which would seem to have come from the Orient. His home country is listed as China, where snub-nosed dogs have always been in favour. He found his way to Europe with traders of the Dutch East India Company and as far back as the 1500s was being admired in the Netherlands. 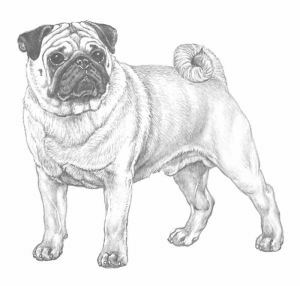 In fact, the Pug became the symbol for the royal patriots. : Decidedly square and cobby, it is “multum in parvo” shown in compactness of form, well knit proportions and hardness of muscle, but never to appear low on legs, nor lean and leggy. : Decidedly square and cobby. : Great charm, dignity and intelligence. Even-tempered, happy and lively disposition. : Relatively large and in proportion to body, round, not apple-headed. : With no indentation. Wrinkles on forehead clearly defined without exaggeration. : Black with fairly large well opened nostrils. Pinched nostrils and heavy over nose wrinkle is unacceptable and should be heavily penalised. : Relatively short, blunt, square, not upfaced. Eyes or nose never adversely affected or obscured by over nose wrinkle. : Slightly undershot. Wide lower jaw with incisors almost in a straight line. Wry mouth, teeth or tongue showing all highly undesirable and should be heavily penalised. : Dark, relatively large, round in shape, soft and solicitous in expression, very lustrous, and when excited, full of fire. Never protruding, exaggerated or showing white when looking straight ahead. Free from obvious eye problems. : Thin, small, soft like black velvet. Two kinds – “Rose ear” - small drop-ear which folds over and back to reveal the burr. “Button ear” - ear flap folding forward, tip lying close to skull to cover opening. Preference given to latter. : Slightly arched to resemble a crest, strong, thick with enough length to carry head proudly. : Level, neither roached nor dipping. : Broad in chest. Ribs well sprung and carried well back. : High-set, tightly curled over hip. Double curl highly desirable. : Legs very strong, straight, of moderate length, and well under body. : Neither so long as the foot of the hare, nor so round as that of the cat; well split up toes; the nails black. : Legs very strong, of moderate length, well under body, straight and parallel when viewed from rear. : With good turn of stifle. : Viewed from in front should rise and fall with legs well under shoulder, feet keeping directly to front, not turning in or out. From behind action just as true. Using forelegs strongly putting them well forward with hindlegs moving freely and using stifles well. A slight roll of hindquarters typifies gait. Capable of purposeful and steady movement. : Fine, smooth, soft, short and glossy, neither harsh nor woolly. : Silver, apricot, fawn or black. Each clearly defined, to make contrast complete between colour, trace (black line extending from occiput to tail) and mask. Markings clearly defined. Muzzle or mask, ears, moles on cheeks, thumb mark or diamond on forehead and trace as black as possible. : Ideal weight 6.3 - 8.1 kgs. Should be hard of muscle but substance must not be confused with overweight.